Ancestry has made its entire collection of immigration records freely available from today for one week. Names of Orphan Children, 1847. Ottawa, Ontario, Canada. Free access will end at 11.59pm on Monday 5 September. Find My Past (the UK version, not the Irish one) has a brand new look and has reduced the cost of its subscriptions. The Full 12-month Subscription price has been reduced by £20 to £109.95 while the 6-month subscription is down from £82.95 to £69.95. Prices for the Foundation Subscription (which gives access only to the 1841-1911 censuses and BMDs for England and Wales) have also been reduced. An additional bonus is that subscription renewals will, in future, attract a 10% discount. This week the LDS church's Family Search finally switched off its pilot site holding the Irish civiil registration indexes and other records. There's now no option but to migrate to the big, unweildy main site for the full range of collections. From the landing page, click Europe and then scroll down to Ireland, Civil Registration Index 1845-1959. The other Irish record collections shown in the menu are largely made up of what used to be known as the IGI and, while useful, need to be approached with some caution; verify any data extracted in these collections as much of it is user-submitted and may not be based on documentary evidence. While the Dublin Freemen records and the Dublin Graveyards Directory will be officially launched tomorrow by the city's Lord Mayor at Dublin City Library and Archive, these collections have actually been online for some time at the Dublin Heritage site. The Genealogy Roadshow (TV programme), RTE1, 6.30pm. Filmed at Glenlo Abbey. *Organised as part of Heritage Week. With the new series of the BBC's 'Who Do You Think You Are?' proving as popular as ever, the UK version of FindMyPast has come up with a timely bonus for those Irish researchers whose ancestors crossed the Irish Sea. The subscription site is offering a 10% discount on all subscriptions quoting the special promotional code of WDYTYA811 if taken out before Wednesday 24th August. The above offer has now expired, but if you click the box to the right you'll find details of FindMyPast's extensive records collection (which includes all England and Wales census records, complete birth, marriage and death records, and extensive specialist records including military) and be able to take advantage of a two-week free trial. Please note, subscriptions to FindMyPast.ie are not included in this offer. An interesting local history lecture series, delivered by the Public Records Office of Northern Ireland (PRONI) and the Open University of Ireland (OUI), is to start in September. The first lecture, 'What is Irish local history?' is scheduled for 29 September when Dr Janice Holmes, Dr Olwen Purdue and Dr Barry Sheehan (OUI) will examine major themes and local history sources. PRONI staff will present examples from the PRONI collection. Lectures will be held at PRONI, 6:30-8:00pm. While admission is free, you must book. Contact proni@dcalni.gov.uk or phone +44 (0)28 90 534800. Ireland Genealogy Projects Archives has had two main themes in the first two weeks of the month. One was personal photos of Irish ancestors, the other was the continuing effort to upload Royal Irish Constabulary Records. Virtually all counties had photos of ancestors contributed. And nearly all had Royal Irish Constabulary records added. A four-part series of The Genealogy Roadshow will launch on RTE1 on Sunday week - 21 August. The Roadshow, which is pretty much celebrity-free, was filmed earlier this summer in four locations. It aims to help people get started with their family history research and also features people connected genealogically to historical events in Ireland or elsewhere. The subscription site Emerald Ancestors, which specialises in genealogy records for Northern Ireland counties, has been busy recently with a spate of new additions to its databases. Baptismal records for Moneymore First Presbyterian Church in the parish of Artrea, co Londonderry have been added. They cover the period 1844 to 1865 inclusive and include the names of the child and parents (including mother's maiden name), dates of baptism and birth and, in most cases, details of the family residence. Nearly 4,000 baptismal records for Ballyeaston First Presbyterian Church in the parish of Ballycorr, co Antrim have also been added. They cover 1820 to 1865 inclusive and include the names of the child and parents (including mother's maiden name), dates of baptism and location of the family home. Date of birth is not included. A whole century of baptismal records, starting in 1820, for Markethill Second Presbyterian Church in the parish of Mullaghbrack, co Antrim are also now in the birth database. Details include the child and father's names, date of baptism and location of the family residence. Mothers' maiden names were not recorded in the original registers. With an additional 100+ new civil marriage records for Comber Church of Ireland, most of them from 1856 to 1882, the listing of marriages recorded at this co Down church is now complete from 1845 to 1921. Entries include the names of bride and groom and date of marriage. Further details available in most cases include the fathers' names and occupations and the residences of the bride and groom at the time of the marriage. Recording more than 25,000 individuals, remnants of the 1851 co Antrim census returns can now be searched at Emerald Ancestors. The database includes complete listings of households in the parishes of Aghalee, Ballinderry, Carncastle, Dunaghy, Grange of Killyglen, Kilwaughter & Larne. In addition, some townlands in the parishes of Aghagallon, Ahoghill, Killead, Newtowncrommelin, Rasharkin & Tickmacreevin are also included. Original spellings have been preserved in the transcription and indexing. Wednesday 4 August: Free entry to Irish Heritage sites (managed by OPW). Scheme offering free admission on first Wednesday of the month started in July. Sunday 7 August: Cnocnafeola Centre in Atticall, co Down. Returning emigrants and their real life experiences will be the focus of an afternoon programme of entertainment. Songs, poetry, a workshop on tracing family history and information about the useful DIPPAM archive resource. Contact Brian White on 07719 593013. Tuesday 9 August: The Peasant's Tale. What would it have been like to have been a peasant in the medieval period? Learn about some of the problems these farmers had to overcome to survive in the 11th century. Tales of Medieval Dublin series of free lunchtime lectures. Wood Quay Venue, Dublin. 1.05pm to 1.45pm. Speaker Cherie Peters. 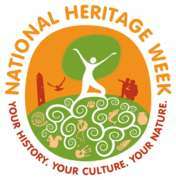 Saturday 20 August to 28 August: National Heritage Week. Go to the website, type in the keywords Family History or Genealogy, and you'll find a host of events across the country aimed at helping beginners discover their ancestors. Tuesday 23 August: The vestry records of the parish of St Bride, Dublin, 1662-1742 - lecture with Ronnie Wallace. Dublin City Library & Archive, Pearse Street, Dublin 2. 6.30pm. Saturday 27 August: Medieval Churches of Ross, an illustrated talk on the ancient churches of the West Carbery area, with William Casey of Skibbereen Heritage Centre, co Cork. Free. Booking required. (0)23 40900. Monday 29 August: Bank holiday in Northern Ireland. PRONI closed.